U.S. Secretary of State John Kerry helped launch a joint initiative between the Harvard Global Health Institute and the Harvard University Center for the Environment, an effort focused on the global health impacts of climate change. The effects of climate change almost always have an element that harms human health, whether it’s heat waves, droughts, spreading disease, or other devastating events. That climate change carries health effects is widely accepted. In 2014 the World Health Organization projected that within 15 years there will be as many as 240,000 deaths a year due to climate-related impacts, a number that very well may be an underestimate, according to background information from HGHI. HUCE Director Daniel Schrag, Sturgis Hooper Professor of Geology and a professor of environmental science and engineering, said it’s reasonable that public health experts focus on solving problems that put lives at risk right now. But climate change is no less an urgent problem, he stressed, even if its threats are mostly long-term. 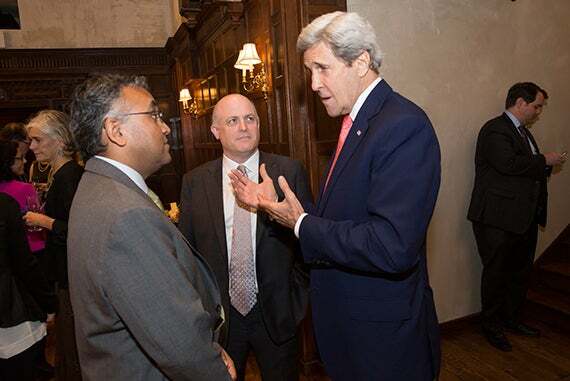 Kerry, Jha, and Schrag spoke at a reception at the Harvard Art Museums. Kerry reflected not just on climate and health, but also on overall progress toward a climate solution, and on the long road he’s traveled since he began working on the issue in Congress in the 1980s. Kerry, who has been credited with helping forge the 2014 climate agreement between the United States and China that set the table for the Paris accord this past December, said that the biggest impact of Paris will likely be the clear signal it sends to global markets. “The success of Paris is that we are sending a 190-plus-nation message to the global marketplace and that we are going to change decision-making — though it is not mandatory — in country after country,” Kerry said. The United States today is ahead of schedule for meeting its 2020 commitment for reducing carbon emissions, Kerry said, and investment behind sustainable energy sources outpaced that for fossil fuels last year. Prices for solar panels have dropped while their efficiency has increased, he added. Should those prices beat those for fossil fuels, he said, the world will have turned an important corner and will see clean energy installation take off. Jha, speaking Friday morning, said the new initiative’s first step will be to convene experts to discuss a specific research agenda and steps toward tackling it. Sasha Kimel, a visiting professor in the Psychology Department, has studied the effect of genetic information on groups in conflict. “We found evidence that if you make Arabs and Jews believe they are either genetically similar or different from another, that can impact their propensity for peace or conflict,” Kimel said.